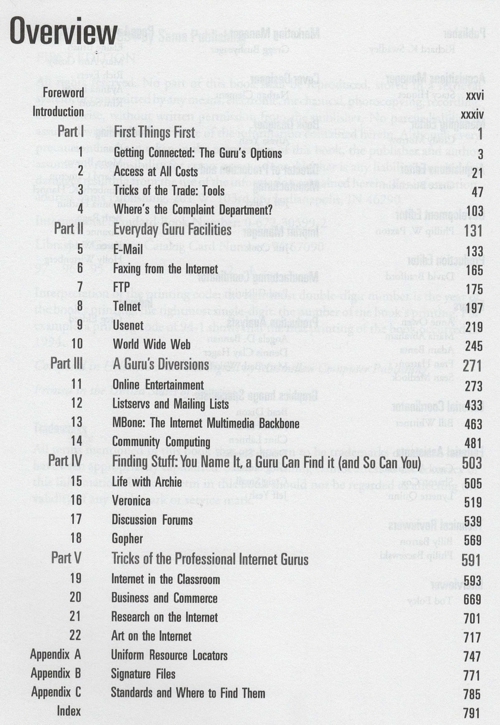 Here's the section header list from the 1994 book Tricks of the Internet Gurus. It's quite surprising how many of those utilities are no longer a thing. Then again, some of them weren't much of a thing back in 1994, either. The large Online Entertainment section, by the way, concerns "How to Program MUDs". It only looks at MUCKs, MUSHes, MUSEs and MOOs, though, and tells you how to program them from within them (using in-game commands). Some things, no-one needs to know now, but someone needs to have known it in the past.